Agent uses POST request to call your URL. Your script MUST get request body first. "Signature" is what your script MAY check to make sure that is was WMSPanel agent who sent it. You can find a small PHP sample of processing the incoming request in out github samples repo. Please also check full XSD for agent request. Go to Control / API Settings and choose Global push API tab. 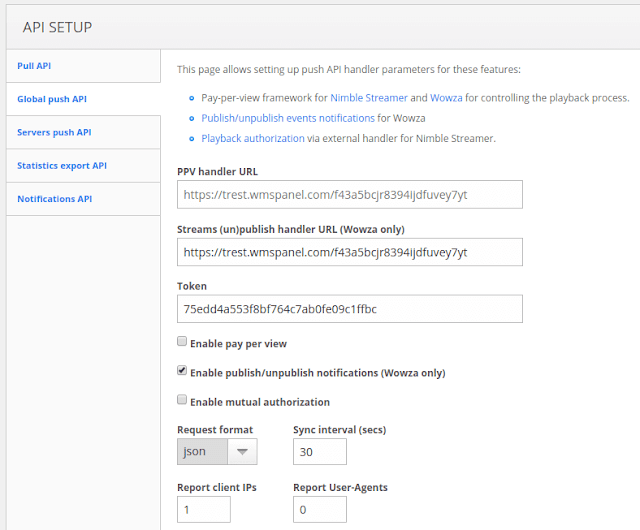 Setting up API handler for Wowza unpublish/publish notifications. 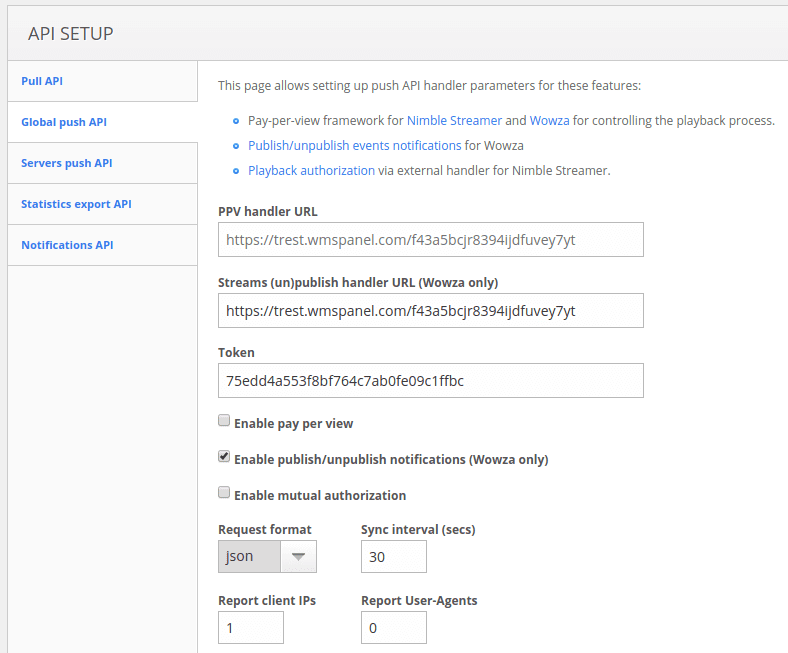 API parameters also include Token field as well as Enable mutual authorization check box. Those should be used if you'd like to use signature as described in section 1 above. You may also make per-server setup. Just click on Servers push API tab to be able to define same settings for each individual server. So now you can set up a testing stream (or use existing one) and then publish it to get notified by the panel via the script. In the given example you'll have new log entry. WMSPanel provides a test handler you can use for trying your calls. This option will work perfectly with Wowza streams control functionality already available in WMSPanel. Please also check full WMSPanel API reference for other API methods including statistics export. Do you guys have a more direct sample of how to implement the script into a PHP page? Like how you have concise sample code for the WMSAuth system.. Thanks! Please use stream-un-publish-notify.php as a very basic sample. Please kindly let us know if you make any improvements to it so we could share to the wider audience. Yes, we'll provide some PHP sample soon in this post. It will be uploaded to our github account: https://github.com/WMSPanel. Meanwhile please drop an email to sales so we could inform you about it and check your account's API settings.